When your vehicle's tire pressure is a mission-critical aspect of its performance and you need accuracy closer than +/- 1 psi, this is the tire gauge for you. 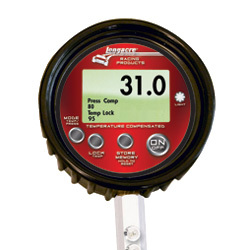 Specifically designed for competitive racing use, this gauge takes the temperature of the tire using a tire temperature probe, calculates the correction back to a standard temperature, and then indicates the pressure that the tire should be set to. What this means is that a reading that might not be the exact pressure you require while you're in the pits making the adjustment, but with this gauge's compensation, the pressure will be accurate where it really counts - out on the track, where tire temperatures are different from those in the pits. 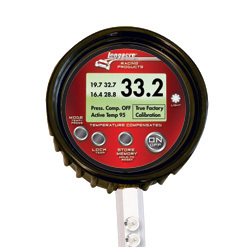 Capable of reading pressures up to 100psi and accurate to 1/10th of a pound, this gauge also serves as a precision tire pyrometer, and offers the capability of storing and displaying the temperatures and pressures of each tire, eliminating the need to write down this information as you continue making pressure adjustments. This kit uses a 17" hose with angle chuck, and comes with an alternate ball chuck, gauge bumper and carrying case. If tire pressures are critical to your car's performance - closer than +/- 1 psi - then you really need what this gauge can do for you. Pressures must be set in the pits but the tires sitting there can easily vary by as much as 20°. You are setting on-track hot pressures by guessing (lots of experience here) at the starting cold pressure. If you want the tire to grow to 38 psi on the track you set it in the pits at say 28 psi. Sounds reasonable. You have been doing it for years. But what was the temperature in the pits? If it was 80° (like it usually is) you are OK. But what if one or two had been in the sun and had crept up to 90°? For every 10° temp change there is a .8 psi change. So instead of 28 psi (at 90°) you effectively set it at 27.2 psi (what it would have been at 80° rather than 90°). Would this make a difference? If not, take a look at our other tire pressure gauges. If it would, (NASCAR™ Cup teams fret about .2 - .3 psi) you really need to set all starting pressures at the same temperature week in and week out. This way the on-track pressures will be the same. But how do you do that? You will have great difficulty controlling the temperatures (impossible really). And yet you need to. A better way is to correct the pressures to what they would have been had you been able to keep the tires at a constant temperature. You could use a pyrometer to measure the tires temp, then use a calculator to compute what the pressure should be at that temp rather than just putting in 28 psi. Slow and cumbersome to say the least. But you don't have to do that. This "Temperature Compensating Tire Pressure Gauge"will do it for you. It can take the temperature of the tire using a traditional tire temp probe, instantly calculate the correction back to a standard temperature, and show the pressure you should be putting in the tire. It may not be the actual pressure at that moment. But it will be the correct pressure when it counts, on the track. Insert the tire probe in the side of the gauge. Measure the temperature the usual way - in the tread area. Push the Mode button to get to Temp Compensation. While in the Mode the pressures will be compensated and correct back to a standard temperature (80°). Push Mode again to go to tire temps or back to traditional tire pressures. Displays actual tire pressures. 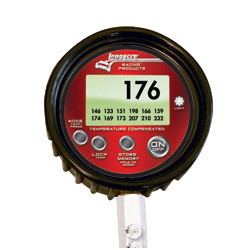 Just take each tire pressure, like when using a traditional gauge but push the Store Memory button and all 4 pressures are available for display. Reads pressures to 100 psi. Accurate throughout the range to 1/10 of a pound! Ultra fast response. Takes tire temps as you normally would. Just insert the probe into the tire and when the temp stabilizes, push Store Memory. All 12 temps are stored on the display so you don't need to write them down as you go. Displays what pressures would be at the standard temperature (80°F). See the full product instructions for additional detailed information.